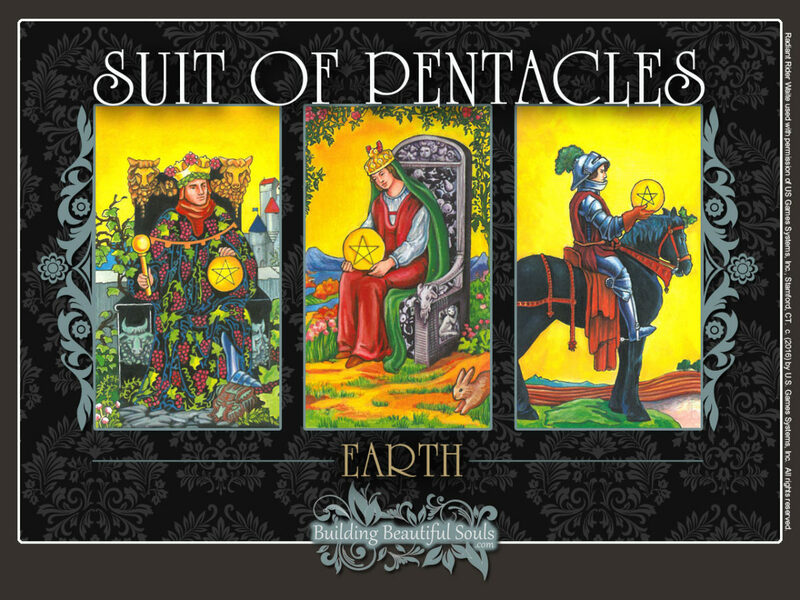 Click on the Suit of Pentacles tarot card you want to learn about. 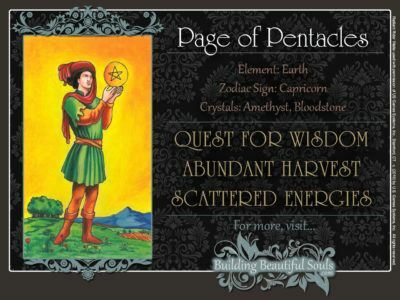 Scroll down to read all about the Suit of Pentacles tarot card meanings! 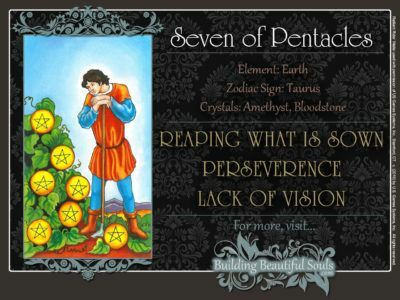 There are a lot good reasons for doing the Snoopy Dance when you see the Suit of Pentacles show up in a reading – and not just because of those loud ka-ching sounds! In older decks, this suit was, uh, coined the Suit of Coins. In a regular deck of playing cards, this suit corresponds to the Suit of Diamonds. 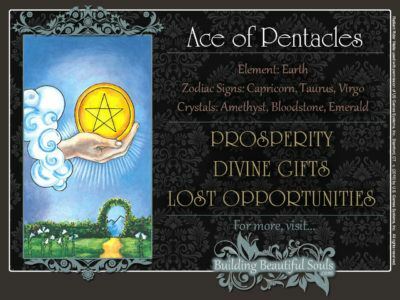 In tarot card meanings, Pentacles symbolize material prosperity and abundance. 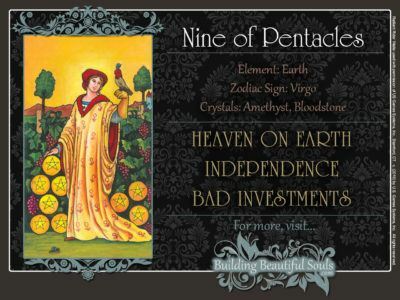 But, sometimes, Pentacles have nothing to do with money at all. Besides, who pays their bills in coins anymore? 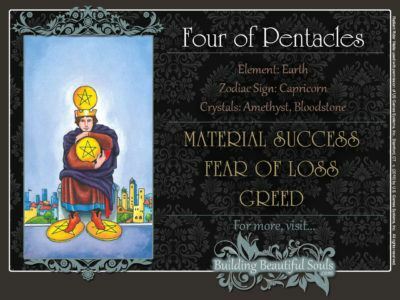 Pentacles tarot cards are all about “true” prosperity and abundance. While money has something to do with that, it isn’t “everything”. 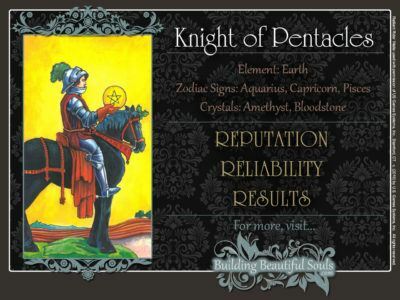 Your well-being and happiness in this material world matter more and Pentacles tell the story of what’s going on or what’s about to happen regarding these. True, not having enough money to pay for basic necessities can be frightening. But in the end it’s only a tool that allows you to get the things you need – just like a hammer is one of many tools needed to build a house. Note that the Pentacles in the Tarot are engraved with Pentagrams. The Pentagram is a five-pointed star, drawn in a single stroke. It symbolizes the universe in perfect balance and governed by spirit. 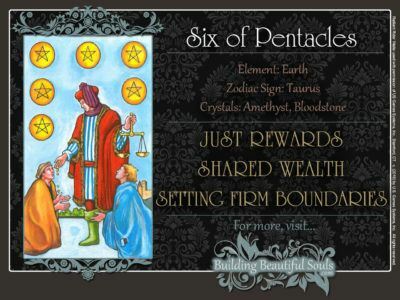 So the Suit of Pentacles is really about living in harmony with the material world? Excellent question. You get a five-pointed gold star! Living in harmony is making sure you’re meeting your physical, emotional, intellectual, and spiritual needs. 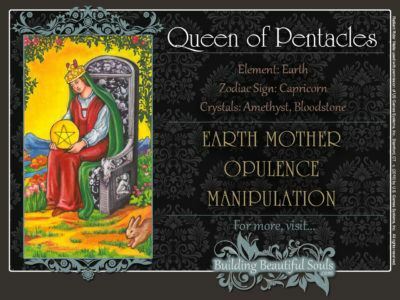 Pentacles are associated with the Element of Earth. They’re also the end result of the manifestation process (reaping what you sow). So if you ever wondered what it’s all about, you’re right in the middle of it. That’s why these Pentacles are inscribed with Pentagrams. The Pentagram’s origin can be traced to ancient Mesopotamia, and its meaning has changed several times throughout history. Here, each point represents one of the Four Elements: Earth, Water, Air, and Fire – plus a Fifth Element: Spirit (Aether, Ether), also called the Quintessence. All elements participate in manifesting an idea. But to make this happen, they must all work in harmony with one another. 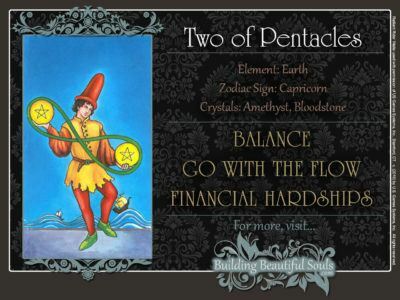 That’s why the Suit of Pentacles is also about balance. The idea that the right side up Pentagram symbolizes good and the upside down version represents evil is only about 200 years old. It’s also an oversimplification. When upside down, the Pentagram actually shows that things are out of balance. The astrological signs corresponding to this suit are Taurus, Virgo, and Capricorn (Western Zodiac). Quite literally, they’re a down-to-earth bunch. A creature of comfort, Taurus is all about enjoying the pleasures of the physical world. Strong willed and determined, this big-hearted sign likes to work hard and play hard. On the other hand, it can also be rather, well, bull-headed. Taurus is loving – and loyal to a fault. On the downside, it can also be very possessive. Virgo’s analytical skills are peerless. They make this sign an excellent troubleshooter and critic. They’re also what make it an insufferable fault-finder, who won’t stop nagging you until everything is picture perfect. Capricorn is the “Type A personality” of this trio. As far as this sign’s high energy is concerned, it can hold a candle to any fire sign. Its forward looking nature matches that of Aquarius. But Capricorn is also organized and conservative, and that’s why it’s an earth sign. This sign is tough, but fair. Although it’s sometimes so tough that it’s pretty hard to see the “fair” part. In a Tarot Reading, when the Suit of Pentacles appears it offers clues and insights about the major aspects of your life in the material world. That includes questions about money and to be more specific, questions about financial stability and growth. 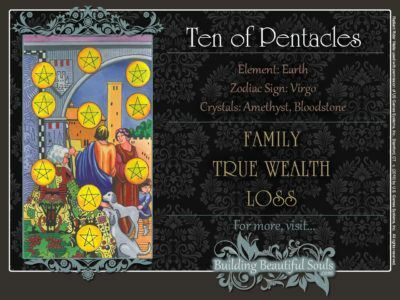 But Pentacles cover more than just dollars and cents. 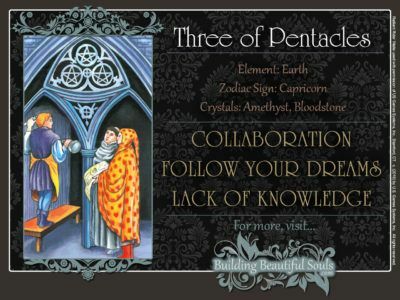 For example in a reading about your career or workplace, Pentacles tell you about job security and opportunities for advancement. 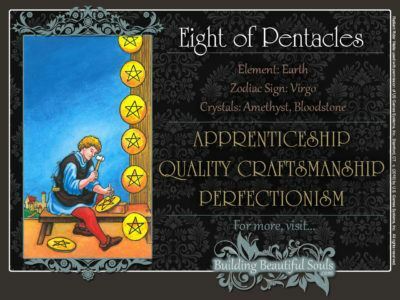 But Pentacles also point out whether your job is helping you grow as a person – or if it’s grinding you down – keeping you “out of balance”. Sometimes, you’re so caught up in just trying to make it through the day that it can be difficult to see the forest for the trees. People are often so focused on getting ahead – or just trying to stay afloat – that they often neglect their health and well-being. 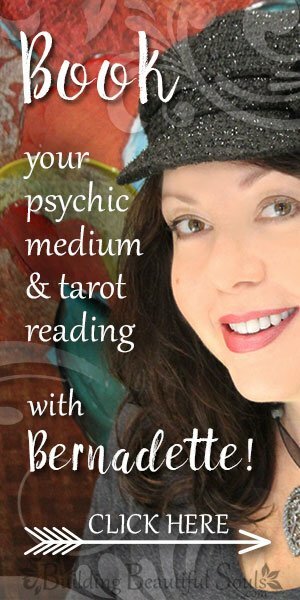 While a Tarot reading isn’t a substitute for a visit to your licensed health practitioner. However, it may suggest that you should see one, if you’ve been feeling off for a while. Your well-being encompasses more than just your physical health. It includes things such as your lifestyle choices, self-image, relationships, and domestic situation. All these things can have a great impact on how you feel, and whether you’ll prosper or not. Your faith and spirituality are important aspects of your well-being, too. 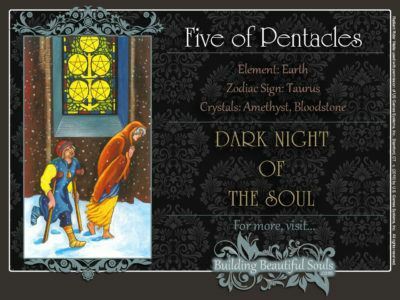 They help you find out how you fit best into this world..
People described by Pentacles are generally practical and down to earth. They often have a good head for business, and they tend to be career-minded. Sometimes, this also makes them materialistic and greedy. 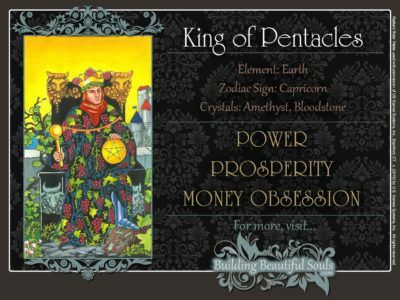 Pentacles personalities are loving, but can be possessive. They enjoy what the physical world has to offer, they’ve also been known to overindulge. And when they’re too obsessed with physical pleasure, they can be reckless with their finances.